A. I have been married for almost four years now and have a really cool little 2 and a half year old daughter. I work as an imports controller. A. Finding balance is always hard for most amateur athletes as we pretty much have to prioritise work. I just make sure that I am up by 04h30 in the mornings that I run. I won’t lie, it was really tough in the beginning but your body just adjusts to it after about 3 weeks of waking up early. A. I normally do about 4 runs a week, 2 chilled 10km's and then maybe a faster 5km in the week. I then try and get a long run in on the weekend, normally a 20-24km. I belong to Durbanville running club and they do a long run from the club every Sunday. Knowing that I will have other runners to run with really helps for motivation. I try and get swimming and cycling in on days that I don’t run. A. I started running about 3 years ago. I have always been quite sporty and played a lot of soccer as a kid, I also took up golf when I was about 17 years old. Running was actually something I never thought I would do as I wasn’t really keen on wearing a vest and luminous shorts. One day a friend from work invited me to run the City to City 21km, I accepted… Not realising that training is required to run this kind of distance, I pitched up on the day and pretty much died for the last 12kms. I came in at 2h05mins… I later heard that it’s actually not too bad for a first half marathon. My competitiveness kicked in and within 3 weeks I bought proper running shoes and a GPS watch. A. I did the Old Mutual Two Oceans Ultra 56km this year which was just an amazing experience. A. I love the socializing aspect of running. I have made so many new friends through it. I love how I feel after a really long run. I live in one of the most beautiful cities in the world. 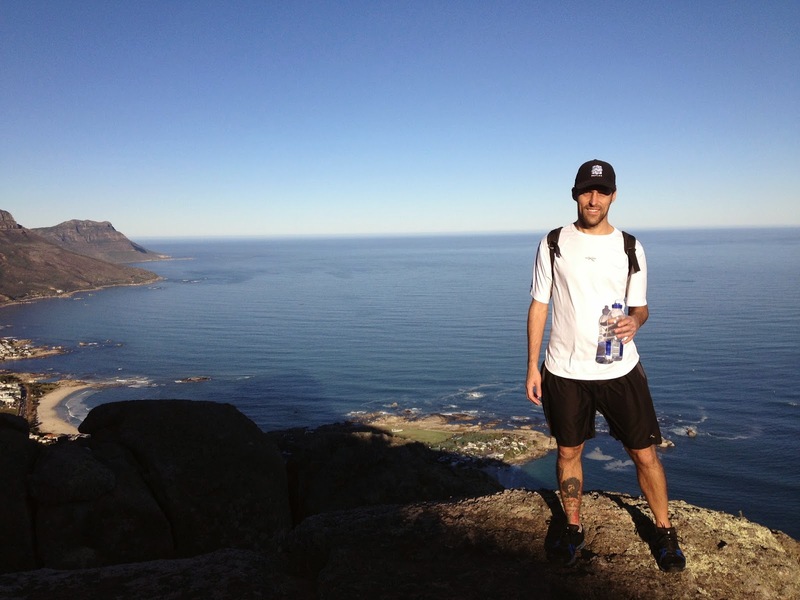 Running has really helped me experience Cape Town’s incredible views. A. I hate the injuries that sneak up out of nowhere. A. My next big thing is the 2015 Comrades Marathon. I have always wanted to do it and I finally feel that I am capable of handling this race. A. Running seems to be getting bigger and bigger each year. People are generally more health conscious these days. I love seeing how busy the bigger races like The Gun Run and Two Oceans 21km get. I think the future of running is very bright. A. It’s rather sad, kids often get stuck into things like XBOX or Playstation. Parents should encourage their kids to get out and exercise as much as possible. A. The Two Oceans Ultra 56km. The atmosphere and views that you get from Chapman’s Peak is just amazing. I get goose bumps just thinking about it. It is one of those races that I will make sure that I do every year. A. I had planned on doing the Reibeek Kasteel Marathon in July this year but I picked up Tibialis-posterior tendinitis on my right ankle 4 days before the race. I was injured for almost two months. I ended up going to a Podiatrist at the Sports Science Institute of South Africa and he sorted me out. Turns out I have a weird running style. A. If you run long distance, you are generally going to feel a little sore after a few hours. I find that running with friends helps me keep my mind off the pain. A. My Nike GPS Sports watch. A. Join a club. You can learn so much from all the experienced runners there.